Burnley boss Sean Dyche has given an honest assessment on Danny Ings’ situation at the club. With supporters resigned to losing the England Under 21 international in the summer, Dyche accepted that the striker’s future at Turf Moor was uncertain. With Liverpool believed to be among a host of clubs sniffing around the 22-year-old, due to his contract expiring in a matter of months, Dyche admitted that the decision lay firmly in the hands of the club’s prized asset. “The signs are he’s going to let his contract run down, but we’ve got good relationships with our own players and we’re really open with them,” he said. “With the business now it’s naive if you think agents are not talking to other people, just by the nature of it. We’re aware of that, we just talk and say be open with us with where it’s at, it’s an ongoing thing. Dyche refuses to be defeatist in ongoing negotiations, but realises that the choice to extend his Turf Moor stay will be among a whole host of other options. Ings has already been rumoured to be the subject of pre-contract offers from Liverpool and Real Sociedad, but a number of alternative suitors are expected to join the race for his signature. “I think it’s still a bit grey all that in this country,” Dyche said. “I was recently talking to someone in Germany and they were saying they’re very open about that sort of thing, it’s almost a given that a player almost says farewell, all the fans accept it, and he keeps playing, they know he’s going to give his lot. “Here everyone is a bit unsure about it, that’s how it seems to me. We’re all human and we all have our own triggers inside, we can’t look at it and say either way it will work itself out, there’s no guarantee. But Dyche won’t get swamped in the speculation and will continue to focus on getting the best out of the seven-goal striker. “I’ll leave that to the powers that be, any clubs that are interested, our club, agents get involved,” he said. “My focus is on him being a footballer and him playing football. Me and Danny have spoken about it, we’ve said just concentrate on your football and play with a smile. That feeling, that energy comes with what you’re doing. 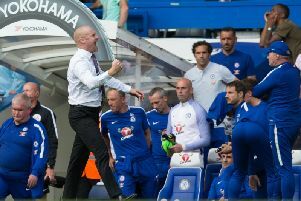 Dyche added: “He strikes me as a young man, taking in a lot of information from a lot of different people and trying to see clarity of performing. Meanwhile the Clarets chief insists the recent scrutiny on Ings will prepare the striker for far more challenging experiences in the future. Having withdrawn Ings just after the hour in the defeat to Sunderland at the Stadium of Light, Dyche said: “If your journey as a young player is to play at the elite levels then you are going to have deal with a lot during that, whether it’s personal, professional, form, moves, agents, TV, media, sponsors, charities, you’re going to have to deal with a lot on your plate,” Dyche said. “From all that is going on he will be absorbing that, taking it in and learning. He’s learning off the pitch now as well. Ahead of the clash with West Brom at Turf Moor, Dyche concluded: “Danny Ings is a Burnley player and he will be ready to go hard when he’s picked and when he’s called upon. All the rest is for the powers that be to sort out. “One player doesn’t decide your future. He was always going to be here. “There’s more players at this club than Danny. He’s a wonderful talent, I enjoy working with him, he’s a fantastic lad, I like him as a person and as a footballer.